Jeff Goldblum’s character in Jurassic Park leveled this caution to the scientists resurrecting the dinosaurs about their inability to control organic evolution. That line struck me as I read Humanize: How People-Centric Organizations Succeed in a Social World by Jamie Notter and Maddie Grant. Their book explores how corporations and large organizations are trapped in antiquated management practices that are more than 100 years old. These “Best Practices” were developed as we industrialized America and overlaid the same assembly line thinking to how we treat employees, customers and the community. It’s all about command and control. Centralized thinking. On a “Need to know” basis. “You’re an important cog in our machine.” Etc. Humanize explores how the DNA of social media – being open, trustworthy, generative and courageous – are the very building blocks today’s corporations must embrace to redefine themselves and flourish in a more social world. This got me thinking. 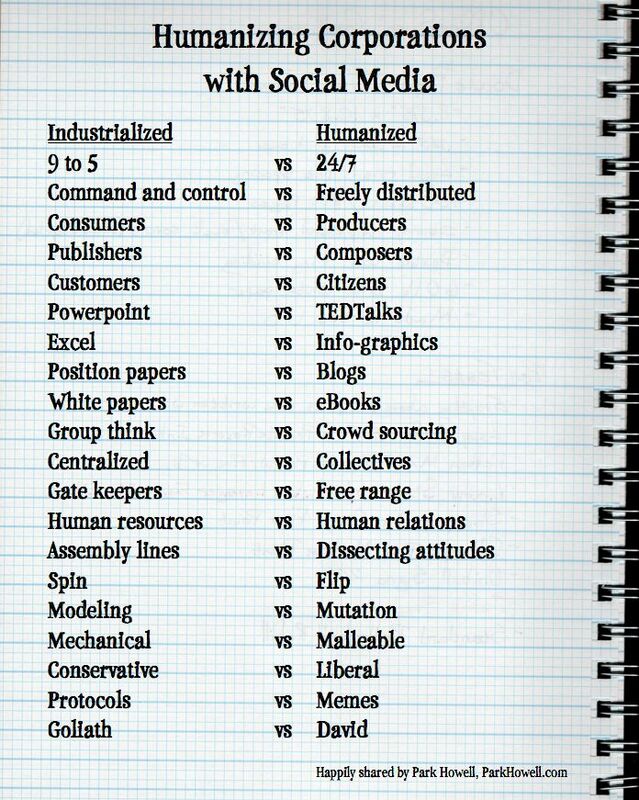 So I jotted down the following list that captures the cold mechanical underpinnings of your typical corporation, juxtaposed to the softer side of social media and its evolving human engagement. How would you compare the two? Park Howell opened his sustainable marketing firm in Phoenix, AZ, in 1995, and uses the power of storytelling to ignite the growth of people, products, companies and causes that dare to make the world a better place. You can follow him at http://parkhowell.com/, and see how his agency uses creativity to heal at http://parkandco.com/creativityheals/.